Ergonomic Work Station Electric Hydraulic Scissor Tables are designed to raise products up to an ergonomic working height. 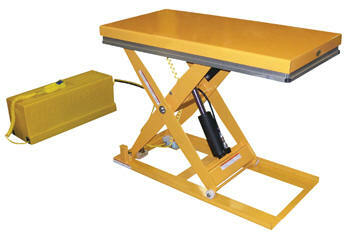 This scissor table maximizes safety with minimum space requirements. Ideal for all types of manufacturing and warehouse facilities. External power unit and hand control standard. Electric toe-guards are standard. See chart below for specs. Available in 24"x36", 24"x48", 32"x48" and 40"x48".